You should conduct Social Media activities in a way that reflects your membership in the Craft, acting in a way that presents a positive image of the fraternity; avoiding private piques and quarrels; being cautious in behavior; courteous to our brethren and promote the general good and to preserve the reputation of the fraternity. Postings should not bring discredit to Freemasonry nor should they fit within the definition of Un-Masonic Conduct as defined by the Maryland Grand Lodge By-Laws, and/or conduct contrary to the accepted and customary rule of right and duty between Freemason’s, or to society in general is improper. You must be aware that postings are a permanent record; and therefore an individual’s conduct may influence the world with a positive or negative image about the individual and also about Freemasonry. Postings and actions on the various Social Media outlets should reflect the highest standards of morality and integrity that Freemasons practice within the Lodge. Lodge notices, and information contained within Lodge notices beyond the time and place of meetings, should not be discussed. There should never be discussion related to petitions, applications, background checks or investigation of an applicant. There should never be a discussion regarding balloting on an applicant. It is improper to identify any Freemason as a member of the Craft unless he has provided his consent or has already identified himself as such. It is improper to post of images, video, recordings, etc. of other Masons without their consent. Posts must comply with the Maryland Grand Lodge Constitutions, By-Laws, Rules, Regulations, and Edicts. Postings that are anonymous or posted by fictitious names should be avoided rather than encouraged. Participation in discussions with those who most often are looking for discussions outside of what is Masonically acceptable should also be avoided. You should never use disparaging comments, profanity, etc. when posting; including, but not limited to, graphic, video, and audio recordings. You should never post "ritual" or “tyled” information. Masonic pages are to be supportive of the organization and its members, promote upcoming events, discuss past events, and discussion of times of fellowship and promotion of Masonic bodies. You should not use Social Media to obtain personal advantage in promoting political, religious or business activities by targeting other Masons. 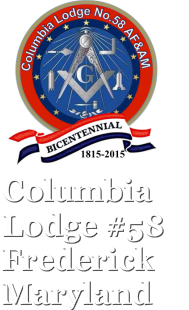 A Brother should advise another if something he has posted is improper within the stated Lodge By-Laws or the Maryland Grand Lodge Constitution, By-Laws, Rules, Regulations, or Edicts. Ultimately, your actions as a Mason online should promote the highest standards of morality and integrity. Posting a comment related to the Fraternity and then posting a disparaging comment about a social or political stance can easily be misconstrued by readers that your stance is representative of Masonry as a whole. Remember; the public and members of the Masonic Fraternity are reading your posts online. I encourage you to be a positive and proactive force for projecting Freemasonry and our Lodge. 1st and 3rd Mondays, 7:30 PM; Fellowship following meeting. As per the Bylaws (2015 revision, Article II, Sec 4), there will be no meeting when the Frederick County Public Schools are closed for inclement weather or if the Maryland State Police declare a snow emergency.